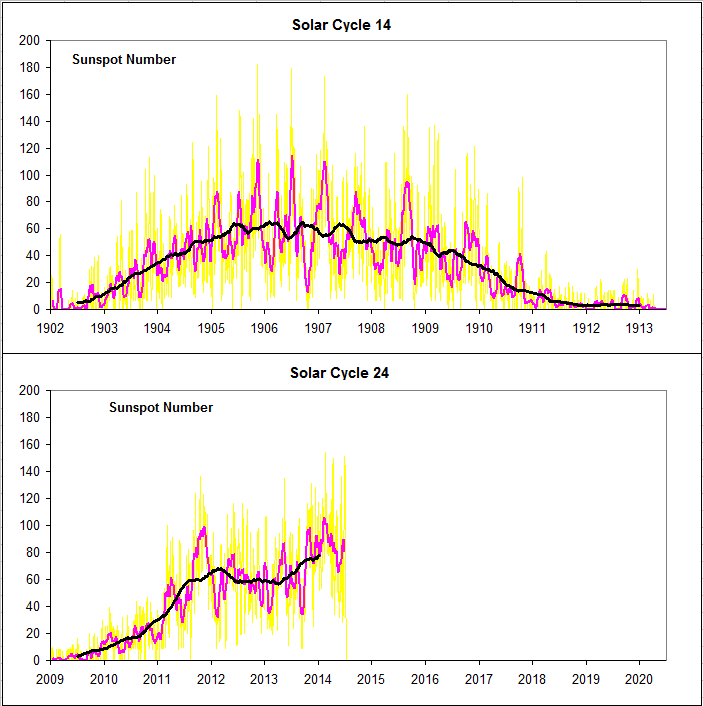 We were told by the mainstream solar physicists Dikpati and Hathaway back in 2008 that they expected solar cycle 24 to be one of the largest ever. Their prediction model failed. I predicted in 2009 that the cycle 24 solar maximum monthly sunspot count might reach around 50 SSN, similar to levels reached in the Dalton Minimum at the start of the 1800’s. Methods of solar prediction using cycles analysis are proving to be more useful than those used by mainstream solar physicists. The reason for this is they represent an underling reality which holds across long time spans, unlike the capricious and unstable output of overtorqued dynamo models that rely on inherent instability to generate variation. As our research and theory development moves forward, I expect we’ll be adding more strong evidence that the consonance between planetary motion and solar activity first intuited by Johannes Kepler in 1619 and elucidated by Theodor Landscheidt in the 1970’s and ’80’s is real, and the need to reorganise our conceptions of the nature of interplanetary space will become more urgent. Something is transmitting force which can’t be accounted for within the current paradigm, the fundamental forces of gravity and electro-magnetism are more effective across the void than theory can currently explain. Time to revisit the long believed in interplanetary medium Einstein eventually rejected on the basis of falsely reported results perhaps. With the sun having very little activity, it has effected our outer atmosphere from picking up particles that would normally be spewing out of the sun. This then has changed the insulation thickness value as our atmosphere is still constantly losing mass to space. Due to our incorrect measuring of atmospheric pressure, we have missed the physical changes to the planet surface which has a different density from the atmosphere. Interestingly science seems to have ignored the fact that in a hard vacuum tube electrons appear uninvited. The missing ingredient in the universe is not dark matter or dark energy it is the void itself unrecognised seething with creative energy. Science has had its head buried in the sand for a hundred years trying to make sense of non sense. That a wrong turn occurred is becoming more obvious as the billions of $’s achieve nothing, going back to the original thinkers as you are doing may show the point where science took the wrong road. Looking from the outside the standard model and quantum mechanics look rather shaky as they run out of plugs to fill the holes. These are consensus science models in the same vein as the climate consensus models and as such are in about the same parlous condition. Keep pushing the truth Tallbloke it always wins. Which is true, and such “underlying reality” cannot be denied anymore. Quite a number of theorists who referred to solar system dynamics having an effect on internal solar dynamics appear to be becoming vindicated. Up to recent times science supposed a space vacuum where some saw the deviation of the light from the stars around the sun, seen during an eclipse, as a “proof” of gravity acting on light, where the humble diffraction (an electromagnetic effect) explained it. Cosmic laws are not hidden from anyone of us, they are to be found everywhere provided we accept its existence, which has been rather “inconvenient” for the ideology of “chaos”, a way of thinking which could be the same as that of “cancer cells” if they could have something resembling a thinking. @Stephen Wilde: thanks for the link to Timo Niroma. I can’t remember the CERN results on the cloud experiments. Anyone have a link please. You seem to be using an old version of TSI reconstruction. Leans etc version in the above paper is to all intents the same as svalgaard’s. Is it possible to replot using the more recent and so valid reconstructions? For some real matching of data and cycles there is this. An almost “perfect match” of cycles to temperature! Using a mere! 38 cycles (or 6 cycles). A bit meaningless really but doesn’t that applies to any curve fitting? Hi Sergei, well if the ‘co2’ period of 2508 years in your linked curve fitting and it’s amplitude are right, we’re all gonna fry so there’s no point worrying about burning the gas. However, I doubt that any self respecting alarmist would admit to any such cyclicity, So the plot is junk, since it won’t hindcast the medieval warm period anyway. Regarding our plot, your concerns are addressed in the article it comes from, so I recommend you read that. Even tho I was expecting this, I’m actually a bit shocked that it happened, I watched as the SSN dropped to 38 then to 1 during solar maximum. How exciting is that! The sun is a fascinating subject, and I have noticed a certain similarity between some solar physicists and climate scientists as the wheels come off their predictions. Why can’t they just say “we don’t know” rather than knock others predictions? One thing that has puzzled me has been how the inner planets contain so many, and so much of the heavier elements. We know they come from supernova, right,? and that this material is blasted to all corners. If our sun is just a “hydrogen ball” then why are the inner planets rocky?. The sun must contain lots of iron right? more than it has produced from its own fusion reaction. So what keeps it from collapsing given that iron cannot fuse further? Perhaps the reaction that drives the sun is something other than just hydrogen fusion? Perhaps we don’t know as much as we think and this is why the sun behaves as it does. How accurately can we count sunspots? and came up with anywhere between 20 and 50 depending on the criteria I used to define a sunspot. Eventually I decided that there was no correct answer. It all depended on how small I allowed the sunspot to become before I decreed that it wasn’t a sunspot any more. that’s not a dumb question! An observer using a high-powered telescope might see 10 or 20 Sun Spots. Using a space-based observatory At the same time you could see up to 50 or 100. * k is a factor that varies with location and instrumentation (usually <1) that accounts for observing conditions and the type of telescope (binoculars, space telescopes, etc.). We ran a thread for him here long ago when the blog was young and the world more innocent. But at what point does a collection of individual sunspots become a “group”? And how large does a sunspot have to be before it’s a sunspot? And how is “k” quantified? There’s obviously still a lot of subjectivity here. One of the things that strikes me about the image I posted above is that if we replace the sunspots with mineral grains it would look just like many of the slabbed rock sections that I’ve looked at. But we geologists wouldn’t even attempt to count the individual grains on a section like that (we have to take our socks off to count over ten). Instead we would simply make an estimate of the percentage of mineral grains on the surface, which takes both number and size into account. And that’s the way I would do it for sunspots too. Another thing that strikes me is that the best way of estimating overall sunspot intensity might be with spectrophotometry (percent dark vs. percent light, or percent yellow vs. percent brown or whatever). Has anyone tried this? I took a look at Geoff Sharp’s work. A lot to take in all at once, but it answers some of my questions about threshold levels for defining sunspots, although they do seem to be constantly changing. Do sunspots tend to be larger during solar maximum or solar minimum, or are they the same? Do sunspots tend to be larger on the front or the back side of the solar cycle, or are they the same? What’s more important, the number of sunspots or the number-times-area product ? (seems to me it should be the latter). On a totally unrelated issue ,I see that at any moment now you will pass 750,000 hits, if you haven’t already done so. Congratulations. 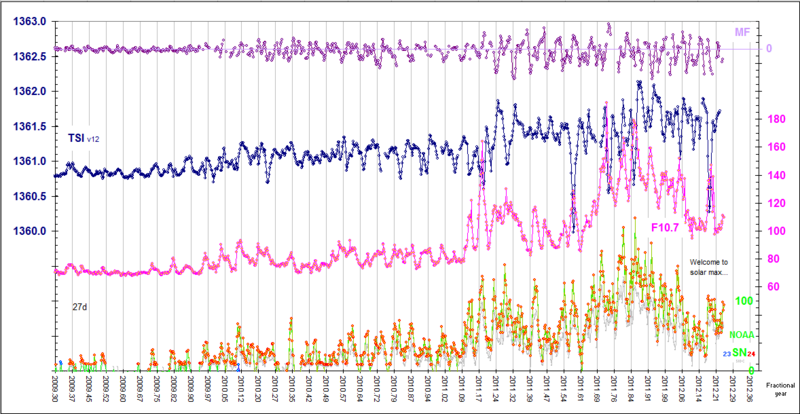 There is the Greenwich sunspot area data, which Hathaway was keeping up to date as a hobby. It is usefully seperated into N and S hemisphere, and I used it to conduct a study on sunspot hemispheric asymmetry, which I need to get back to, because it is important. Re your replication of the Lean TSI reconstruction. You stopped the projection much much much too early. It’s clear from the 2nd chart that the two major / longer term cycles were coming together and both trending down. It looks as if the projected TSI therefore had some considerable distance to fall, possibly going lower even than the Maunder minimum. Please resurrect the software that produced that graph and re-run it to 2200. Did I read somewhere that we only need a drop of about 3 w /sq m to start a glaciation ? I don’t know what that would translate to in terms of temperature, but if TSI continues to relate to temperatures as per the first of the TSI graphs, then the UK (and all of the northern Hemisphere) would likely experience some difficult, perhaps impossible agricultural problems in 100 years or so. Would that be step one down into the next ice age ? That is one horrific potential projection you guys have produced. Please extend that graph to it’s obvious conclusion in 2200. It’s interesting to note that the two largest cycles cancelled each other out during the Dalton Minimum, and that it was only the effect of the smaller cycles that produced the Dalton Minimum. It’s also of note that the two largest cycles were not in phase during the Maunder Minimum and that the TSi was held higher than might otherwise have been the case by the three smaller cycles. In other words from your unfinished projection we can expect the next minimum to be a great deal worse than the Maunder over the next 200 years. This time frame would tie in with the stuff Landscheidt was predicting. It should indeed be named the Landscheidt Minimum. based on research done in 2006.
cycles will be weak with peaks in sunspot number < 80.
time to solar maximum is before or after that maximum. the 22.3-yr period for the level of sunspot activity. after only one Hale Cycle. de Vries, or Suese, Cycle). followed the phase catastrophe in the late 1870s. Agreed. That looks like important stuff. Any chance of getting the data you used to construct the plots? It’s unlikely a glaciation would be provoked by a solar minimum. This is because glaciations are primarily a function of Earth’s changing orbital parameters, the Milankovitch cycles. Looking at those, we may get away with it, even though going on the last million years of regularity, we are due for glaciation at any time. We don’t want to try to project beyond 50 years yet, because the values for the cycle lengths the software derived from the Lean TSI proxy (which is imperfect), are not close enough to actual planetary cycle lengths to be confident beyond that time period. Another thing we intend to get back to. Bottom line is, no-one knows the future. Roger A: I’ll email you for a chat. From the end of the referred to article. “Given that the Lean TSI reconstruction is no doubt imperfect, there remains the question of how a curve generated by nearby exact planetary synodic frequencies would look compared to it. This is a project I’ll be undertaking soon. What happens when you project the synthesized curve further backwards and forwards in time? Myself, I’m looking forward to it. One request though, take it to 2200. Actually if the public did panic it would at least have the beneficial side effect of bringing to an end the waste of money on windmills that increase co2 instead of lowering it. Putting money into heat pumps instead of windmills would be far more cost effective, and could even reduce co2. If the future does indeed start to look severe, I might have to start living like EM Smith, though as I would prefer a Mediterranean climate I might have to move somewhere warm and civilised first. I agree that much can be learned by looking at solar-planetary dynamics as a recurrent phase-locked-loop system. In such a system loss of lock, with resulting loss of phase coherence, will frequently occur through “cycle slippage.” The instances of cycle slippage are what Landscheidt and others have called “phase catastrophes.” Phase-locked-loop systems have the inherent ability to regain phase lock and phase coherence at some point, however. Even in a robust and relatively simple system, though, it is difficult to predict exactly when cycle slippage and consequent loss of lock are apt to occur, or when phase-lock/phase-coherence is likely to be regained. Both these circumstances depend on the inherent resonant tuning of the system, and the solar-planetary system resonant tuning is quite complex. Jupiter is a clearly dominant driver, but the state of the entire system as a whole determines whether it is in a locked (coherent) or out-of-lock (noncoherent) phase mode. I somehow knew that, and since I first saw your formula, I was very excited about it, but still I think it needs some refinement. Anyway, I feel some such formula that you are aiming at is both useful and needed, but I think first of all that Sun is in different state at different times, and one formula is never enough to cover all its behaviour. I appreciate your attempts and would ask you to continue, although I think the formulas needed are not an easy task. I put forward the hypothesis that both go hand-in-hand. The engine behind Solar Cycle is “magnetic induction” caused by the Sun accelarating/decelerating in a strong magnetic field. The acceleration/deceleration is caused by the effect of gravity caused by the planets. The strong magnetic field (external to the Sun) is the same field causing the extreme heating the Sun Corona. The sun spot cycle has stopped increasing because the engine behind it (magnetic induction) paused. The Polar Magnetic field reacts with a delay to the effect of magnetic induction (the magnetic reversal). The reversal is happening at the moment the solar spot count should have increased rapidly … this is what is behind the phase catastrophe. With ‘normal cycles’ the solar spots continue to increase until a maximum has been reached that is dependent on the already available magnetism (built up during the prior cycles). Congratulations. That 3/4 million should grow quickly thanks to the openness and timely, fascinating discussions — with respect. I also want to refer to J Martin’s concern. If not the return of an ice age, or rather a continuation of “our” glacial period, aren’t we about due to one of those Bond Events? I refer to the 6th century — fall of Rome and entry into the Dark Ages. See E.M. Smith and Bond Event Zero. http://chiefio.wordpress.com/2009/04/06/bond-event-zero/ According to all those graphs, Ice Ages come upon us “slowly”; we have time to travel south (or north). 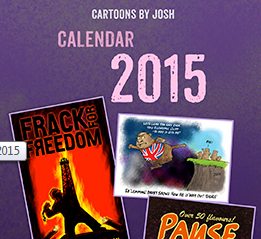 Even more reason to be grateful for blogs such as yours, Tallbloke. If enough people can understand that we must get the science right, we might be able to redirect CAGW funds towards something “useful” and “helpful”, including real scientific research. God help us when we begin to get polar weather in temperate zones! Last I saw solar scientists were still having problems nailing the mathematics of the sun – milankovitch cycles to earth temperature. As I remember, and that’s an achievement these days, the MCs don’t change the solar insolation sufficiantly to produce an ice age. Am I correct.? Something happens, though more rapidly, in an electric induction motor (http://en.wikipedia.org/wiki/Induction_motor ), when changing polarity from one stator field to another, and that is how energy is converted into work (gravity?). Not forgetting that every Cycle is a Wave, and every wave is the way electromagnetism propagates. Richard: In raw TSI terms the numbers are not big, but combined with changes in ocean circulation, I think they are sufficient. But I wasn’t therre to witness it with a thermometer network last time round, so it’s an open question. The Sun may well have less spots of late but it seems to have gone mental in attracting water. I have spent the late afternoon and early evening watching a totally empty Estuary fill to the brim and some more. What power in gravity. Why are we not exploiting this? The energy required to pump millions (billions) of gallons of water in and out of just one estuary must be close on equalling or bettering all the windmills in existance produce. I believe there was a post a few weeks ago about the neatness of the circa 11/22 year cycle of Saturn/Uranus conjunctions and oppositions (or I think I saw it in a link from a post). Anyway, I fed “2007” into the http://www.fourmilab.ch Solar System Live generator and found that Jupiter is exactly 90 degrees to the Saturn/Uranus opposition of that year. Seeing as what I had read was emphasising the effect that this S/U opposition might have on the Sun, it follows that Jupiter would have upset whatever that effect may have been in 2007. I realise that this would all be incorporated in Tim’s Algorithms but it’s interesting to see a possible instance of cause and effect. More importantly, that effect would seem to be influencing the generation of spots 5 years later. This would in turn shed light on the mechanisms that influence the development of the cycle and prove the fact that they are operating well in advance of the observed end result i.e. the spots, or lack of them. Tim: Thanks for the data. I’m working with it now. So watch out. Well done, 3/4 million views and counting!! 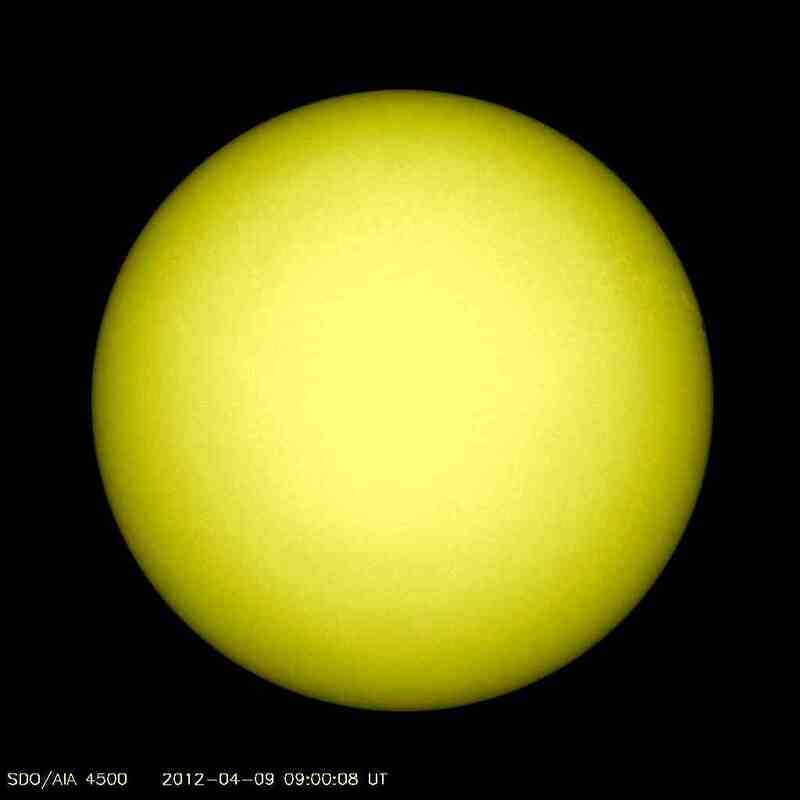 In 2004, The BBC posted a report titled “Sunspots reaching 1,000-year high”, the report inferred that the Suns spot cycle was amplifying man made global warming. So, even tho the sun drives the Earths temperature “Causing it to warm and chill” the warming is being amplified by man made gases, remember the “1,000-year high”? Well, if we had just experienced man made global warming, caused by the sun amplified by the burning of fossil fuels, I think appropriate that man made global warming can NOW be considered unremarkable. Another BBC CAGW Cause and Effect = FAIL!! “The data suggests that changing solar activity is influencing in some way the global climate causing the world to get warmer. Interesting: a 2.0 W/m2 TOA TSI decrease by 2040, at the same time that reduced magnetic field protection could increase Earth’s cloud cover. Of course going from 26% cloud cover to 28% cloud cover (albedo change 0.15 to 0.65?) means that another 13.4 W/m2 of SI is reflected, for a total of 15.4 W/m2, whole earth 3.9 W/m2. Which is greater than the 2C proposed for a doubling of CO2 (3.4 W/m2). So we get some sort of global temperature drop (though I suspect buffering re-actions reduce a 2C drop to more like 0.4 – 0.6C). It’s all about adding up the various modifiers. Sometimes they combine positively, sometimes they negate, sometimes – like now – they combine negatively. @Sparks says: It´s time for us to forget those senseless ideologies. As I said time ago: “God is the ultimate conspirer”, so…..it´s over kids, game is finished! One of the most consistent solar proxy and climate cycles is the 208 year cycle. Look back 208 years (actually 210 I think) and you have your answer. Ray, yes. What we need is the answer why. My suspicion is it lies in an unexpected place since many people have looked hard and found nothing. Outside the solar system is one possibility. @vukcevic: Hey Vuk, the time is due for you to give us a detailed explanation, as an electrical engineer you are, how this machinery works, presumably powered by the galaxy, a kind of induction electric motor with twelve stator coils around (?). SC24 is thus not exceptional in that regard. The layman’s count is uncalibrated junk, trying to replicate solar cycle 5 in the mistaken belief that the SSN for that was determined by Wolf. Except that Wolf was not born yet and the values Rz has for SC5 were collected and processed by Wolfer in 1902. The numbers that Wolf collected were about twice as high. The SIDC is, if anything, undercounting the sunspot number, as they themselves admit. This is ultimate in the pseudoscience. I have added one more graph which with the ‘customary modesty’ I will call ‘the Vukcevic cycle’. or if you wish 2*105 = 210 for a ‘DeVries Cycle’. 105 year is a destructive cycle! The equation equilibrium (zero values) are on the graph and do not show any J-S angular consistency so gravitational effect appear to be excluded. Since period of the cycle is pretty consistent, just above 50 years, and not related to the solar cycles intensity, charging by solar particles doesn’t appear to be the case. I don’t want to get into an argument. You link a comment showing a spurious FT because it was not properly windowed. Given the name on that and a history of insults to do with FT and goings on (reason will become clear), I want nothing to do with it. Not to do with you. Maybe discuss this some other time. ‘FFT-Power-Spectrum-SSN.png’ it has been renamed so link is inoperative (you may need to click ‘refresh’ since it may be stored in your pc’s ‘temp. internet files’. You can also delete preceding sentence. I note that you keep invoking the windowing of the discrete FT (Fourier Transform) as a reason to ignore the FT of certain time series. I would like to briefly highlight two of the common problems associated with obtaining the discrete FT’s of spatial or time series data and maybe you can explain the specific problem(s) that you are having with the plots that are being posted by Vukcevic. Underlying this discussion is realization that discrete FT is only an approximation to the continuous FT, since by definition the former produces a finite number of frequencies and the latter an infinite number. Nature normally gives a continuous (analog) signal that is varying in space or time [for the sake of argument I will assume that we are dealing with a signal that is varying in time and not space]. In the real world, however, we are often presented with a sample of the underlying continuous signal, with the sample points being equally spaced in time (i.e. a time series). This means that if we want to obtain the FT of the sampled signal, we must use the discrete FFT (Fast Fourier Transform) to obtain a FT.
One way to ensure that we do this, is to sample the signal at a frequency (Fs) that is at least twice the maximum fluctuation frequency (Fmax). This means that your final FT should be free of aliasing for fluctuations that have periods that are longer than 2 years [since period = 1 / frequency]. This comes about simply because the first and last points in the original (time-series) signal are non-zero. This means that there is a sharp discontinuity or step at the beginning and end of the sampled signal which introduces very high frequencies (fast fluctuations) into the signal. If these fast fluctuations (high frequencies) are not removed from the signal then they will cause aliasing into the final discrete FFT. The easiest way to remove these discontinuities in the sampled signal is to normalize the data by subtracting the mean and then apply a hanning window. This is a fancy way of saying that you multiply the time series data by a mask that smoothly decreases the data values to zero at either end of the time-series. The gradual drop off in signal to zero at either end ensures that sharp discontinuities are removed. I assume it is the latter that you are referring to in your post above. High on the mountains a dam retains water in order to make it fall down (gravity, work, force)to produce electricity (by moving a conductor in a magnetic field), then energy is transmitted through wires to your kitchen´s blender. You wake up…and go to the kitchen, then put your blender on..electricity (gravity, work, force) makes the rotor coil to be attracted from one surrounding stator coil to the following, there, in every change, work, force, gravity is regenerated (the one that was released at the dam). Funny, but if you accumulate electricity you are accumulating: work,force, GRAVITY, for stirring your blender. That the sun decided to have a holiday at the peak of AGW madness when we were but a hairs breadth from having a UN directive controlling our lives, does show that the gods have a sense of humour. That the crazy policies of the west are geared for warming, we may end up a few Watts short in our power supplies. It is the time for all those scientists such as those that have been side lined by the consensus who’s predictions are coming true, to shout the truth from the roof tops. The danger for the welfare of all people on planet Earth is cooling, warming and CO2 is beneficial it is life blood and food. This sombulent sun bothers me not, but I have children and grand children who will suffer the agony of a green agenda driven by false political manipulated pseudo science. The true nature of our solar system and the effect of the universe on it is a long way from our understand of it. The climate of our planet is controlled almost exclusively by outside influences, what happens on our planet is only weather as our thermostats try to reach equilibrium in the midst of chaos. Those of the consensus and others who disregard the outside influences are playing with weather and as can easily be seen, not doing well on climate prediction, nor weather as they ignore the outside influences. Of recent times over at WUWT Roger was being savaged as an astrologer and I mentioned to Willis that our climate was controlled as he should know by outside influences. He told me that he knew no such thing, virtually telling me I am full of crap. So I posted a simple reply. Take away the sun and the planets and we are a dead rock in the void. Willis agreed. @Wayne Job That the sun decided to have a holiday at the peak of AGW madness when we were but a hairs breadth from having a UN directive controlling our lives, does show that the gods have a sense of humor. The gods do…but the guys waiting for profits don´t, they will ask all their butlers to attend the final meeting, at the Rio Earth Summit, next June. They will own the amazon jungle to lease it like “carbon shares”. Global Warming is “Sustainability” now. Business as usual…. Yes, it will be the same “experts” shifting to the use of Resource Misery and Scarcity model predictions. Until you planetary theorists can explain the Interstellar Magnetic Field compression (‘like sitting on a beach ball.” “David McComas IBEX lead) of the heliosphere to the relationship of the now defunct solar POLAR field (squash) and the source surface field bulging in the middle being stronger than the polar fields and the flux flowing to and fro from the polar fields being in some weird arse slow motion, I can’t see your planetary theory, though it is sometimes kinda interesting. How’s that for a run on sentence? What is happening over at solarcycle24? Looks deader than a door nail. One more thing McComas didn’t say dent in the nose of the heliosphere. Two different compressions we have going on. Two different mechanisms. Maybe 10 rappen cheese is less wholesome. Taking a non-scientific “chartist” view of the latest Hathaway “prediction” is interesting. Are solar flecks being counted?